When you buy a high-quality tree, plant it correctly, and treat it properly, you and your tree will benefit greatly in many ways for many years. When you buy a low-quality tree, you and your tree will have many costly problems even if you take great care in planting and maintenance. enough sound roots to support healthy growth. a trunk free of mechanical wounds and wounds from incorrect tree pruning. a strong form with well-spaced, firmly attached branches. crushed or circling roots in a small root ball or small container. a trunk with wounds from mechanical impacts or incorrect pruning. a weak form in which multiple stems squeeze against each other or branches squeeze against the trunk. Any of these problems alone or in combination with the others will greatly reduce the tree’s chances for a long, attractive, healthy, and productive life. When buying a tree, inspect it carefully to make certain it does not have problems with roots, injuries, or form. Remember the acronym RIF; it will help you remember roots, injuries, and form. Here are some details on potential problems and some other considerations that you should be aware of when buying a tree. Bare roots should not be crushed or torn. The ends of the roots should be clean cut. If a few roots are crushed, re-cut them to remove the injured portions. Use sharp tools. Make straight cuts. Do not paint the ends. The cuts should be made immediately before planting and watering. You should be able to see the basal trunk flare. The flare is the spreading trunk base that connects with the roots. 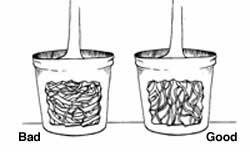 Root balls should be flat on top. Roots in soil in round bags often have many major woody roots cut or torn during the bagging process. Avoid trees with many crushed or torn roots. After placing the root ball in the planting site, cut the ties and carefully pull away the burlap or other fabric. Examine any roots that protrude from the soil. If many roots are obviously crushed or torn, the tree may have severe growth problems. If only a few roots are injured, cut away only the injured portions. Use a sharp tool. Use care not to break the soil ball around the roots. Cut the wire on wire baskets. Place the basket into the planting site. Cut away at least the top two wires without disturbing the root ball. Inspect exposed roots for injuries. If many roots are injured, the tree may have serious growth problems. If the trunk flare has been buried, gently expose it before planting the tree, taking care not to damage the bark. Roots should not twist or circle in the container. Remove the root ball from the container. Inspect the exposed larger roots carefully to see whether they are twisting or turning in circles. Circling roots often girdle and kill other roots. If only a few roots are circling, cut them away with a sharp tool. Trunk flare should be obvious. Be on alert for trees planted too deeply in containers or trees “buried in fabric bags. As with root-balled stock, you should be able to see the basal trunk flare with container-grown plants. If the trunk flare has been buried, gently expose it before planting the tree, taking care not to damage the bark. Beware of injuries beneath trunk wraps. Never buy a tree without thoroughly checking the trunk. If the tree is wrapped, remove the wrap and inspect the trunk for wounds, incorrect pruning cuts, and insect injuries. Wrap can be used to protect the trunk during transit but should be removed after planting. 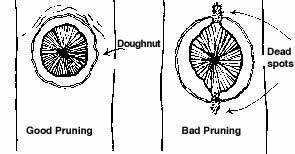 Incorrect pruning cuts are major problems. 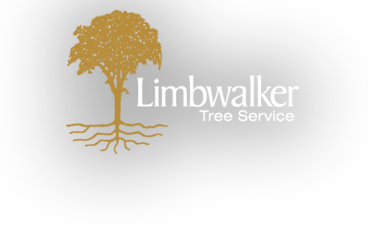 Incorrect pruning cuts that remove or injure the swollen collar at the base of branches can start many serious tree problems, cankers, decay, and cracks. Incorrect pruning cuts that leave branch and leader stubs also start disease and defect problems. Do not leave stubs. 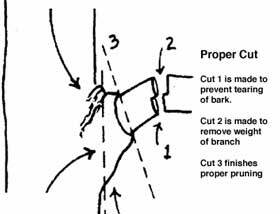 A correct pruning cut removes the branch just outside of the collar. A ring, or “doughnut, of sound tissues then grows around the cut. Do not make cuts flush to the trunk. The closing tissues may form only to the sides of the flush cuts. Trunk tissues above and below flush cut branches often die. When the heat of the sun or the cold of frost occurs, cracks or long, dead streaks may develop above and below the dead spots. Good, strong form, or architecture, starts with branches evenly spaced along the trunk. The branches should have firm, strong attachments with the trunk. Squeezed branches signal problems. Weak branch unions occur where the branch and trunk squeeze together. As the squeezing increases during diameter growth, dead spots or cracks often begin to form below where the branch is attached to the trunk. Once this problem starts, the weak branch attachment could lead to branches cracking or breaking during mild to moderate storms. When several branches are on the same position on the trunk, the likelihood of weak attachments and cracks increases greatly. As the branches grow larger and tighter together, the chances for splitting increase. Avoid trees with two or more stems squeezing together. As stems squeeze together, cracks often form down the trunk. The cracks could start from squeezed multiple leader stems or where the two trunks come together. If you desire a tree with multiple trunks, make certain that the trunks are well separated at the ground line. Remember, trunks expand in diameter as they grow. Two trunks may be slightly separated when small, but as they grow in girth, the trunks will squeeze together. Look for early signs of vertical trunk cracks. Examine branch unions carefully for small cracks below the unions. Cracks are major starting points for fractures of branches and trunks. The small cracks could be present for many years before a fracture happens. Always keep a close watch for vertical cracks below squeezed branches and squeezed trunks. If your tree has only a few minor problems, corrective pruning may help. Start corrective pruning one year after planting. Space the pruning over several years. Remove broken or torn branches at the time of planting. After a year, start corrective pruning by removing the branches that died after planting. Most nurseries produce high-quality trees. When you start with a high-quality tree, you are giving that tree a chance to express its dignity for many years. Remember RIF.